For people suffering from psychological trauma as a result of violence, detention, poor living conditions, failed attempts to leave Malta and general uncertainty about the future, being able to access mental health support is crucial. 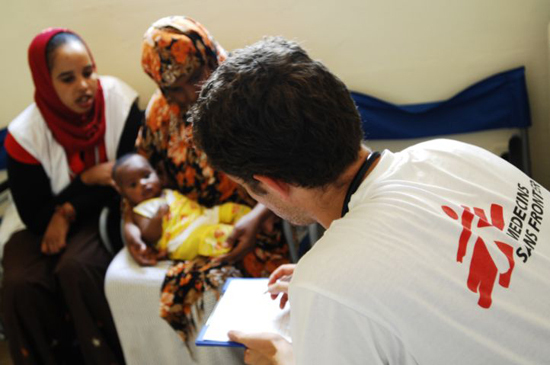 An MSF doctor speaks through a cultural facilitator with a Somali woman who, along with her baby, is suffering from a skin infection. Over the past few years, migrants and refugees crossing the Mediterranean Sea from Africa to Europe have found themselves in Malta, an island measuring 316 square kilometers (122 square miles) and holding 400,000 inhabitants. Escaping conflict, deprivation, or other human rights violations, many migrants, most of who are from sub-Saharan countries, travel to Libya, where they set off on a perilous sea crossing. In 2008, more than 2,700 asylum-seekers arrived in Malta. However, the intensification of border controls in the Mediterranean in 2009 has resulted in a drastic decrease in landings. 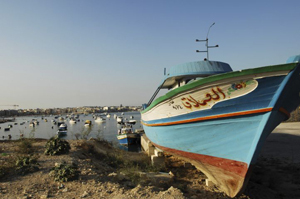 Between January and July 2010, only 28 asylum seekers made it to Malta’s shores. Despite the decrease in new arrivals, there are still more than 3,000 migrants and refugees living on the island. The largest group comes from Somalia. This wooden boat was used to transport migrants and asylum-seekers from Libya to Malta. 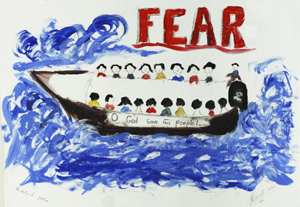 A picture painted by a child in an MSF mental health program for migrants and asylum-seekers. Upon arrival, all asylum-seekers are systematically detained for up to 18 months. With the decrease in new landings, two out of three detention centers have been shut down. After their release from detention, migrants and refugees are given a place in one of the open centers on the island. There, they can move freely and begin to build a new life in Malta. But living independently and becoming integrated into Maltese society remain difficult, and their living conditions are still poor. Living space is often overcrowded and lacks adequate water and sanitation facilities. They struggle to find jobs, and prospects for the future are grim. Asylum seekers who leave Malta to try life in another European country are often forcibly sent back to the island. According to a European Union convention known as ’Dublin II’, asylum-seekers coming to Europe must remain in the country of their arrival while waiting for their asylum claim to be examined. A European fingerprint database ensures they can be identified and forcibly returned to the European country they arrived in first. As they lose hope of building a life in Malta, an increasing number of people have tried to escape the island to live elsewhere, only to be forcibly returned later on. As a result, many face additional social and psychological problems upon their return to the island. Today, migrants and asylum-seekers in Malta have access to medical care in public health facilities. However, mental health services for asylum seekers and refugees on the island are still inadequate. For people suffering from psychological trauma as a result of violence, detention, poor living conditions, failed attempts to leave Malta and general uncertainty about the future, being able to access mental health support is crucial. MSF began providing healthcare and psychological support to undocumented migrants and asylum-seekers in Malta in August 2008. Initially, medical care was provided inside two detention centers for migrants: Safi and Lyster Barracks. Consultations in the centers quickly revealed how the appalling living conditions and a lack of access to healthcare, including mental healthcare, were endangering the physical and mental health of the detainees. Nearly 20 percent of all health complaints were respiratory problems linked to exposure to cold and a lack of treatment for infections. In March 2009, after repeatedly asking the authorities to improve conditions inside the centers, MSF suspended its activities in the detention centers, but continued to provide medical care to migrants in the open centers. At the same time, MSF published “Not Criminals”, a report exposing the appalling conditions migrants were subjected to in Maltese detention centers. In June 2009, MSF resumed activities inside Takandja, the detention center where migrants were taken on their arrival in Malta. Takandja closed in March 2010. In 2010, MSF decided to reorient its activities in order to focus on mental healthcare for migrants living in open centers and in the community. Throughout its time in Malta, MSF has advocated for better access to healthcare and improved living conditions for migrants and asylum-seekers living on the island. Today, they have access to medical care in the island’s health centers and hospitals. MSF has also trained a number of ‘cultural mediators’, some of whom have been hired to work in public health facilities to facilitate the consultations. However, difficult living conditions and inadequate mental health services still remain a problem for migrants and asylum-seekers in Malta. Today, MSF provides psychological support to migrants and asylum-seekers who show symptoms of depression, anxiety, or post-traumatic stress disorder. From January to July 2010, MSF carried out 389 psychological consultations, with a total of 130 patients. The cultural mediators are trained by MSF to identify symptoms among people living in open centers, and they are provided with the basic counseling tools to support their peers. MSF is now helping to set up a network of Maltese and international organizations which will be able to provide continued mental health support. At the end of 2010, after two-and-a-half years in Malta, MSF plans to hand over its activities to this network.